A team of astronomers led by The University of Texas at Austin's Howie Marion has detected a flash of light from the companion to an exploding star. This is the first time astronomers have witnessed the impact of an exploding star on its neighbor. It provides the best evidence on the type of binary star system that leads to Type Ia supernovae. This study reveals the circumstances for the violent death of some white dwarf stars and provides deeper understanding for their use as tools to trace the history of the expansion of the universe. These types of stellar explosions enabled the discovery of dark energy, the universe's accelerating expansion that is one of the top problems in science today. The work is published in The Astrophysical Journal. The subject of how Type Ia supernovae arise has long been a topic of debate among astronomers. "We think that Type Ia supernovae come from exploding white dwarfs with a binary companion," Marion said. "The theory goes back 50 years or so, but there hasn't been any concrete evidence for a companion star before now." 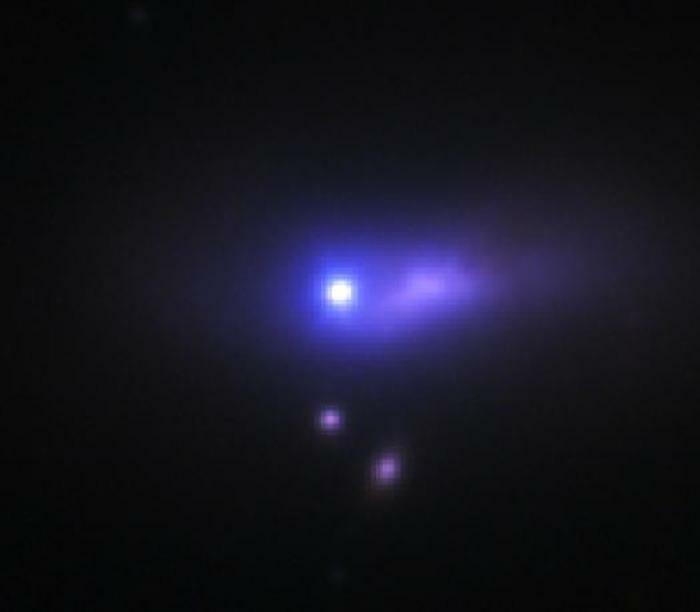 Astronomers have battled over competing ideas, debating whether the companion was a normal star or another white dwarf. "This is the first time a normal Type Ia has been associated with a binary companion star," team member J. Craig Wheeler said. "This is a big deal." Wheeler is a supernova expert and professor of astronomy at the university. The binary star progenitor theory for Type Ia supernovae starts with a burnt-out star called a white dwarf. Mass must be added to that white dwarf to trigger its explosion - mass that the dwarf pulls off of a companion star. When the influx of mass reaches the point that the dwarf is hot enough and dense enough to ignite the carbon and oxygen in its interior, a thermonuclear reaction starts that causes the dwarf to explode as a Type Ia supernova. For a long time, the leading theory was that the companion was an old red giant star that swelled up and lost matter to the dwarf, but recent observations have virtually ruled out that notion. No red giant is seen. The new work presents evidence that the star providing the mass is still burning hydrogen at its center, that is, that this companion star is still in the prime of life. According to team member Robert P. Kirshner of the Harvard-Smithsonian Center for Astrophysics, "If a white dwarf explodes next to an ordinary star, you ought to see a pulse of blue light that results from heating that companion. That's what theorists predicted and that's what we saw. "Supernova 2012cg is the smoking - actually glowing - gun: some Type Ia supernovae come from white dwarfs doing a do-si-do with ordinary stars." Located 50 million light-years away in the constellation Virgo, Supernova 2012cg was discovered on May 17, 2012 by the Lick Observatory Supernova Search. Marion's team began studying it the next day with the telescopes of the Harvard-Smithsonian Center for Astrophysics. "It's important to get very early observations," Marion said, "because the interaction with the companion occurs very soon after the explosion." The team continued to observe the supernova's brightening for several weeks using many different telescopes, including the 1.2-meter telescope at Fred Lawrence Whipple Observatory and its KeplerCam instrument, the Swift gamma-ray space telescope, the Hobby-Eberly Telescope at McDonald Observatory, and about half a dozen others. "This is a global enterprise," Wheeler said. Team members hail from about a dozen U.S. universities, as well as institutions in Chile, Hungary, Denmark, and Japan. What the team found was evidence in the characteristics of the light from the supernova that indicated it could be caused by a binary companion. Specifically, they found an excess of blue light coming from the explosion. This excess matches with the widely accepted models created by U.C. Berkeley astronomer Dan Kasen for what astronomers expect to see when a star explodes in a binary system. "The supernova is blowing up next to a companion star, and the explosion impacts the companion star," Wheeler explained. "The side of that companion star that's hit gets hot and bright. The excess blue light is coming from the side of the companion star that gets heated up." Combined with the models, the observations indicate that the binary companion star has a minimum mass of six suns. "This is an interpretation that is consistent with the data," said team member Jeffrey Silverman, stressing that it is not concrete proof of the exact size of the companion, like would come from a photograph of the binary star system. Silverman is a postdoctoral researcher at UT Austin. Only a few other Type Ia supernovae have been observed as early as this one, Marion said, but they have not shown an excess of blue light. More examples are needed. "We need to study a hundred events like this and then we'll be able to know what the statistics are," Wheeler said.